The islands of Tahiti are among the most beautiful islands in the world. 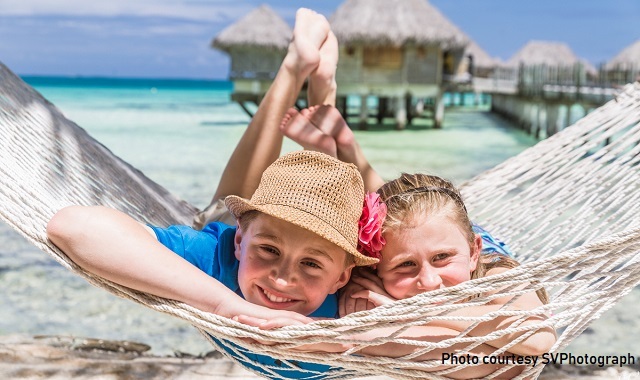 Tahiti is widely known as one of the world’s best honeymoon and romantic vacation destinations, but did you know that Tahiti is also an excellent destination for families? Tahiti’s crystal clear, calm lagoon waters, beautiful white sandy beaches, and exciting excursions are perfect for travelers of all ages. These travel tips will help you plan an exciting family getaway to some of the world’s most breathtaking island. Big or small, the memories of Tahiti will last a lifetime. Tahiti is an excellent year-round destination. The months of January – May and November through early December tend to offer the best value for international airfare, domestic airfare, and hotel rates. You will find excellent promotions for families during these times as well as during the summer months. Some fabulous deals include discounts for 2 accommodations and packages where children can stay free and eat for free with a paying adult. People often ask us, “When should I book my family’s travel package?” The answer is, “NOW!” Keep in mind that there are very few airlines that service the islands of Tahiti. Air Tahiti Nui is the largest carrier offering daily flights from Los Angeles to Papeete, Tahiti. Air France offers 2-3 flights per week from Los Angeles and Hawaiian Airlines offers just 1 flight weekly from Honolulu. The limited amount of departures combined with a high demand for flights and seats means that it’s wisest to book your international flights at least 120 days to 10 months in advance. One of the best promotions available for families is through Air Tahiti Nui’s “Kids Fly Free Program.” Children ages 11 and younger at the time of travel fly free internationally with 1 or 2 paying adults, and also receive free inter-island flights to select islands including Moorea, Bora Bora, Huahine, Tahaa/Raiatea, Tikehau, and Rangiroa. There are an extremely limited amount of these “Kids Fly Free” seats on each flight, so booking at least 6-11 months in advance is essential to guaranteeing the best rates. Your Tahiti Travel Planner Specialist can let you know the dates on which these promotions are valid. Does your family enjoy hiking through the mountains? Tahiti and Moorea are perfect for hikes! Love to snorkel and dive? Rangiroa and Tikehau offer some of the world’s finest snorkeling and diving. Interested in experiencing a local accommodation or an off the beaten path island? Maupiti, Huahine, and Raiatea offer unique traditional Polynesian experiences. After a relaxing getaway at an especially unique beach? Your family would love the calm turquoise waters and pink sand shores of Tikehau. Looking for the utmost in luxury? A family vacation to The Brando Resort on Tetiaroa or the Four Seasons Resort Bora Bora would certainly fit the bill. With so many beautiful islands and amazing resorts to choose from, it’s critical to have a knowledgeable person guiding you to your perfect vacation. One of the amazing aspects of working with Tahiti Travel Planners is that after speaking with you, our travel specialists can determine your vacation “personality” and recommend the ideal island and best resort so that you can make the post of paradise and do things your way. Contact your Tahiti Travel Specialist to help you plan your perfect trip to paradise today!